Vice President of DTEC Plant Services Ltd., Sandy D. Smith greets Electrical Installation major, Jervante Hutchinson, who is among BTVI’s class of 2018. Kendrick Montpetitt was still in his security officer uniform when he attended the Bahamas Technical and Vocational Institute’s (BTVI) recent speed networking initiative. He got off from his night shift at 7 am, ran a few errands and patiently waited at BTVI. “Some companies don’t acknowledge receipt of your resume, so today was a day to have a conversation. To have the opportunity without much effort, it can’t get better than this,” said the Information Technology Management major. 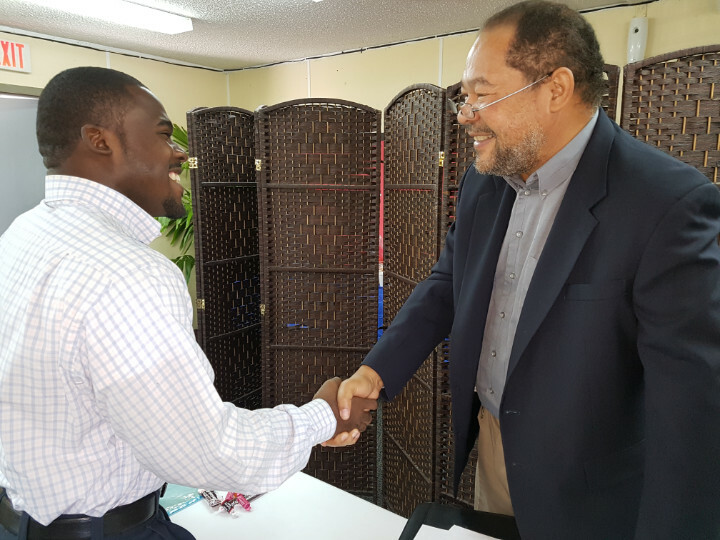 Kendrick was one of many students who took advantage of BTVI’s speed networking and job fair. Speed networking was an opportunity for students to connect with professionals in various fields for five-minute timed sessions. The professionals had a rubric to grade each student including on their appearance and poise, skills’ presentation, delivery and language, resume and overall interview. Nail Tech major, Gabrielle Tracey, beams during her interview with the Human Resources Manager of Wildflowers, Ordain Moss during BTVI’s speed networking initiative. 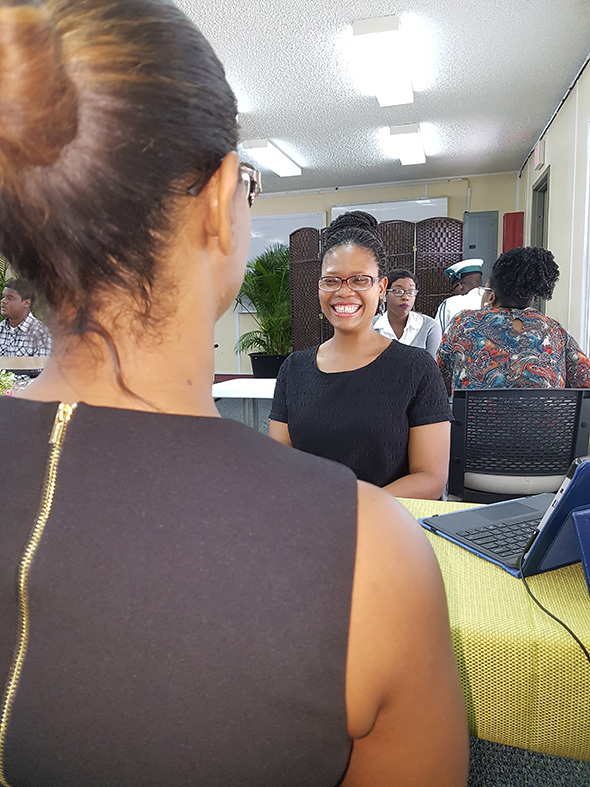 BTVI’s chairman, Kevin Basden, noted that granted an interview does not give the full scope of whether a person is employable, the speed networking initiative was noteworthy. “We see this as a means of helping to prepare students for the next step after graduation. I know how important the intake process is and we would appreciate feedback from participating organizations on the shortfalls or gaps,” he said. Also in attendance was Electrical Installation major, Jervante Hutchinson, who is among BTVI’s class of 2018. “I am looking for work so I can get funds to start my Electrical licence course. I hope I sold myself well enough to get hired,” said the young man. “I believe they are looking for persons who are equipped with knowledge and skills right now. When I came to BTVI, I knew nothing. Half way through the semester, I could do things on my own. I am leaving here, knowing all the basics about residential electrical,” said Jervante. Vice President of DTEC Plant Services Ltd., Sandy D. Smith, was impressed with the students he interviewed. The company manages the maintenance and operations of the Chilled Water Plant (CWP) and emergency backup generator, which provides cooling of air conditioning systems for the entire Baha Mar property. “This is a good bunch of students from diverse backgrounds, in terms of skillset. They are eager students, which is a good motivator,” said Mr. Smith. DTEC has a staff of 25 of whom all have passed through BTVI at some point. Fifteen of the employees were hired as a direct result of performance during their internships. Participating in the speed networking initiative was Chair of the Electronics Engineering program, Delano Archer. “They seem more confidence than I expected. No one is below average. I just want them to be specific in their answers,” he noted. Meanwhile, BTVI’s Dean of Student Affairs, Racquel Bethel explained that her department wanted to provide students with access to industry employers. The team saw it as a networking opportunity that could lead to not only job, but career opportunities. “Interviewing can be intimidating, so we want them to know what they can expect and prepare them to make a seamless transition into the workforce,” she stated.